Okay, so I know summer has barely shown its face so far this year, but we can still enjoy all of the yummy summer fruits, right? Obviously I am a big fan of sweet strawberries and raspberries, but there's no denying that they get more than their fair share of airtime at this time of year. What about the other fruits? They've been waiting for their time to shine all year and then they get overshadowed by showy strawberries. Apricots, blackcurrants and cherries are all pretty damn delicious right now and I think we need to spend some time with them. This apricot and almond cake was a delight to make - a simple batter dotted with little golden jewels (it's worth taking the time to arrange them in a pretty pattern, if just for you own satisfaction), which comes up smelling absolutely gorgeous and is perfect served warm with a dollop of cream. This is the cake we deserve this summer. Preheat the oven to 180C. Prepare a 20cm cake tin by greasing with butter, lining the bottom with baking paper and dusting with flour. Place all of the cake ingredients (butter, sugar, eggs, ground almonds, flour, milk and vanilla extract) into a bowl and beat with an electric mixer or whisk until light and fluffy. Spoon the batter into the prepared pan and spread evenly. Place the apricot quarters on the top, pressing down lightly. Bake for 30-35 minutes. Check after 20 minutes if the top is browning too quickly and cover with foil if needed. The cake should be springy to the touch when cooked, and a skewer should come out clean when inserted into the centre. Turn out onto a wire rack and dust with icing sugar. Allow to cool completely or serve warm with cream or ice cream. Despite my love of baking and my very sweet tooth, I'm not actually a big cake-eater. I'll devour a brownie any day, and I can never resist a slice of pie, but I usually avoid cake. Particularly if there's icing involved - it's very tricky to get the icing-to-cake ratio correct so that your mouth doesn't get stuck together with sugar. However, no two cakes are baked the same so it would be unfair to tarnish every one with the same brush. This cake, for example, is a cut above the rest. The idea for this cake came to me as I was sitting at my desk, like a little bolt of sugar-coated lightning. Like all good ideas, of course, it was not an original one - probably planted there by Pinterest or the endless scrolling of food blogs that makes up my spare time. 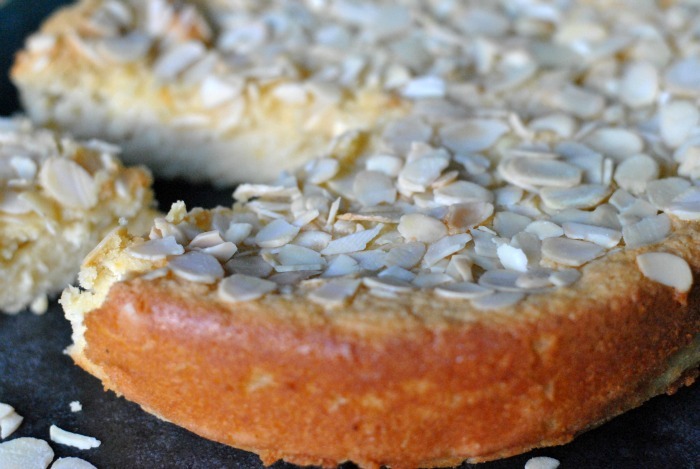 It felt like a flash of inspiration, though - a cake made with almond and ricotta and subtle citrus flavours. It's almost a pudding, rather than a cake, and is delicious chilled or covered with cream and served with berries. This isn't stodgy and sugary, it's creamy and light, with a delicious crunch of toasted almond flakes on top. And even me, with my cake aversion, cannot resist that. Preheat the oven to 160C. Prepare a round cake tin by greasing lightly with butter and lining the base with greaseproof paper. Beat together the butter and 150g of the sugar until light and fluffy. Add the zest and vanilla to combine. Add the egg yolks one at a time, beating well in between. Fold in the ground almonds and ricotta until well combined. Whisk the eggs and remaining 75g sugar in a separate bowl until the mixture forms stiff peaks. This is easiest with an electric mixer but can be done by hand. Fold a spoonful of the egg whites into the cake batter to loosen, before gently folding in the rest until combined and smooth. Pour into the prepared tin and sprinkle over the flaked almonds. Bake for 40-50 minutes until golden around the edges. The middle will still be wobbly, but will firm up as it cools. Remove from the oven and allow to cool completely in the tin before serving. Dust with icing sugar or serve with a drizzle of cream.